My name is TheseStars and I'm your personal Astrologer. I believe its my destiny to help you find your destiny in your own STARS and STAR NUMBERS. I'm betting you didn't know that you have your own personal NUMBERS that were divinely given to you at birth. Get ready to be amazed. I know what your thinking, "what the heck has NUMBERS have to do with the STARS"? Well Astrology, star-logic as I like to refer to it, as a science is based on the astronomical process which requires the use of mathematics to measure the stars positions in the heavens. This is where you own personal STAR NUMBERS are hidden. As an art, Astrology, is the interpreter of nature and it shows that the world is conducted according to a very well-defined plan. This is where your own personal NUMBERS will come to show their intimate connection with you at specific periods of time in your life according to your STARS. Your personal NUMBERS are simply the measurement of the STARS for the exact moment of your birth. If you're like me, you'll see the magic all around you through NUMBERS. Even the word NUMBERS tells us with its own letters that, MEN USE. Do you see that? Do you see that there is also the words BUS RUNS---doesn't the Department of Transportation use ﻿NUMBERS﻿ to declare bus routes? Yes, they do. I use to catch the number 62 bus in front of my house to get to Elizabeth Penn Station. Then of course there is also the words NURSE, SUN and BURN hidden within the words NUMBERS, and we all know how important it is have your #15 Sun block with you when you hit the beach. Or how about heading over to your favorite deli and ordering up the number 9 submarine sandwich. Even in the word, ﻿NUMBERS﻿, it tells us the MEN USE NUMBERS for R SUB MENUS. But the word I like best coming out of the word NUMBERS was finding the word SERUM and the word SUM, and the word MUSE. All these words being able to be born from the word NUMBERS itself has me convinced that these dang little darlin's, 0 through 9, have a little life all their own. As an example of how wonderfully precise your Stars Numbers can actually be, let's take a peek at the star charts and lives of some of our endearing celebrities. It's absolutely fascinating to see how Marilyn's Star Numbers connect with the details of her life with stunning accuracy. The MOON at 19° of Aquarius in Marilyn's birth chart can also be interpreted as measuring ﻿319°﻿ of total celestial longitude. NOTE: The Zodiac is made up of 360° in which it is divided up into 12 segments all measuring 30° each. 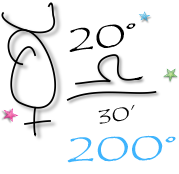 So Aquarius being the 11th sign of the zodiac begins its celestial measurement at 300°. All we need to do is add the 19° of which the MOON is positioned in Aquarius to get a total of 319°. On 9/13 in 1946, at age 20, Marilyn's divorced to James Dougherty was granted. 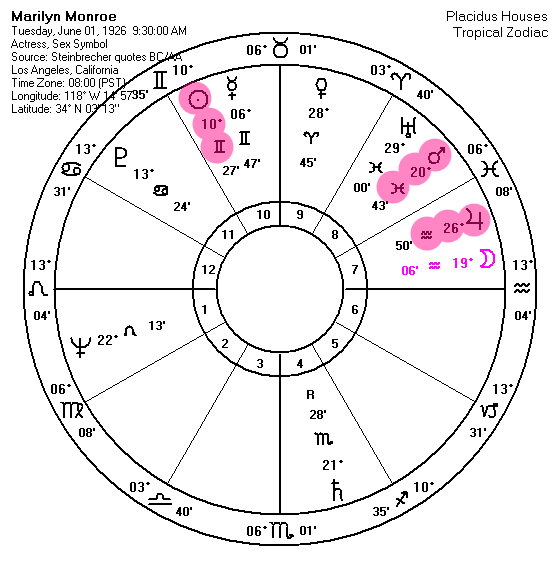 Marilyn has Mars at 20° of Pisces. 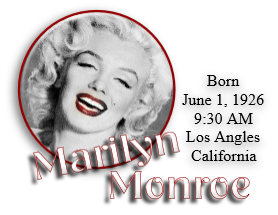 On 9/13 in 1953, at age 26, Marilyn makes her first live television debut on Jack Benny Comedy series. She has Jupiter at 26° of Aquarius. Saturn is the planet of stability which allows us to plant roots. Saturn measure 325° which is the same numbers as 3/25 the day he purchased Graceland in 1957. In March of 1958, Elvis arrived at the Memphis Draft Board and was assigned serial #53 310 761. 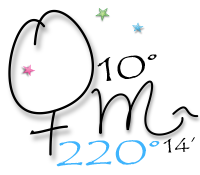 His midheaven (public life) at 26° Virgo measured 176° of total celestial longitude. We see this number appearing again as a date of 7/16 in 1962 when the movie, "Viva Las Vegas' opens nationally and which has thus far has become his highest grossing film ever. On 9/22, his Mercury measurement at 292°, Elvis ships out on the USS Randall to serve 18 months of active military duty in Germany. Jupiter, the planet of long distance travel, measure 18° of Scorpio. 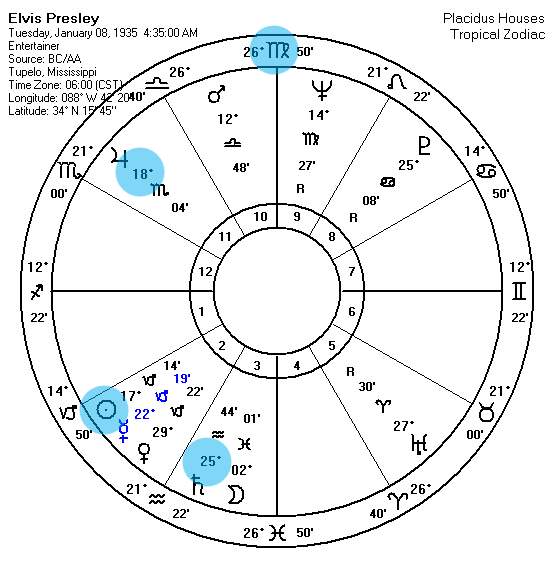 Elvis' Sun Number is 287° and can become the date 8/27 for when The Beatles held a visit with Elvis at his home in Belair and had an informal Jam Session. 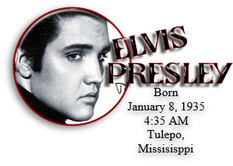 In 1971, on 8/22 Elvis receives the Lifetime Achievement Award from the National Academy of Recording Arts and Sciences. 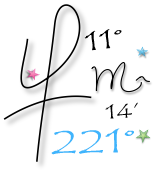 This is his Jupiter Star Number that measured 228° of celestial longitude. John Lennon's last concert appearance in 1974 in Madison Square Garden was with Elton John. The date was 11/28. John had two planets Mercury and Mars measuring this date in time. Mercury was 218° and Mars was 182°. This number also appears as Yoko Ono date of birth of 2/18 in 1933. John's MOON total 303 in total degrees of Longitude. In a man's chart the MOON signifies the women in his life. 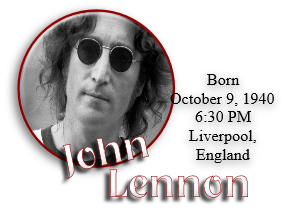 Cynthia Powell, Lennons' first wife and mother of Julian Lennon had a date of birth of 9/10, which corresponds to John's Aries Ascendant Star Number of 019°. Mercury was 8° of Scorpio at John's birth and he was shot on the 8th day of December. 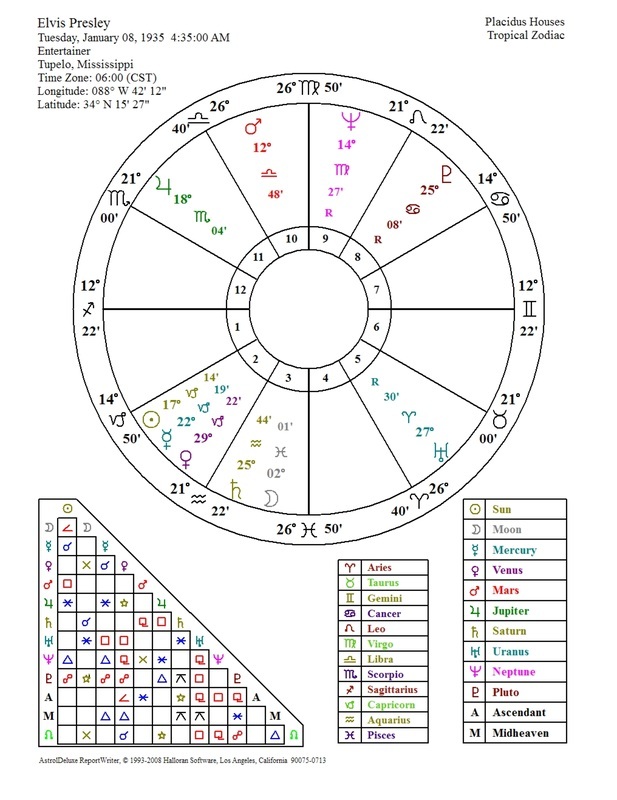 When you visit our Blog you'll get more example like these---they are endless, because everyone lives are detailed by events, that are further detailed by the dates that they happen, and for the good of God the same numbers as the detailed measurement of their birth Stars. When you order your Stars Numbers, you get a seasoned Astrologer personally erecting your birth chart and physically making note of your Star Numbers. Delivered to you downloadable as PDF file. This is not a computer generated service. It's personalized and its potent. So Please allow up to 2 weeks for your Digital Delivery. Once you order, I'll write to you so we can get started. Personally, I can't remember a time when I wasn't interested in the stars. Even as a small child I remember being mesmerized by the Moon following me while I sat starring at it from the backseat of my fathers old Ford. Here are some tidbits about me and my own stars and their measurement. I am a Virgo by Sun Sign, so I'm 'The Boss' when it comes to details. It's certainly explains me discovering our Star Numbers. My Sun rests in my 5th house of creativity, children, gambling and romance. So, it is no wonder, I love to use the stars to gamble and found an interest in researching the details of missing children. STAR NUMBER DETAIL: On my Sun Number day, 7/15 in 1998 I was scheduled by the American Federation of Astrologers to present my findings in the research I conducted on stranger abducted children. I was 25 years old when I began my professional astrological studies, and I was 37 in 1998 when I got to share my work with my astrological peers at the AFA convention in Orlando, Florida. My Moon is in Gemini in the first house, so I can mingle with anyone, the President of the United States or the hobo on the corner. It's easy for me to get swept up in the moment of any situation with that 1st house Moon so I prefer to be the presence of good situations and people. Since my Moon is in the 3rd house, the house of names, its common for me to give everyone I know a nick-name. I can also do voice over work for all my animations. STAR NUMBER DETAIL: My younger sister's birthday is 3/06, my MOON number. The Moon in my chart rules both my 3rd and 4th houses. The 3rd rules sisters and bothers, aunts and uncles, and nieces and nephews, while the 4th rules the home and neighborhood. When my niece was born first, I moved across the street from my sisters house so that I could be close enough to see often enough the newest member of our family. My Mercury is in Libra in the 6th, so I love small animals---I don't even kill the insects I find in the house--I just scoop'em up and take'em back out side. The 6th house is also the house of health and food, and I always have to eat in my meals in balance. For instance, when I have a full breakfast, I will have enough toast to last me for the last bite of egg, potato and bacon. Their will probably be one more sip left in my cup of coffee as well. Libra is all about balance. I probably should of been a detective, but instead, I got all muddy learning astrology and than I dug a deep hole looking at the matter of missing children and adults. It's twenty years later and I am convinced we can use the Stars to find the missing. My Mars is in trouble in Cancer. I'm over protective. Always have been. It's okay if your Mom's not around, I am. an aggressive driver. This Mars placement has me ready to protect others when I see danger lurking. 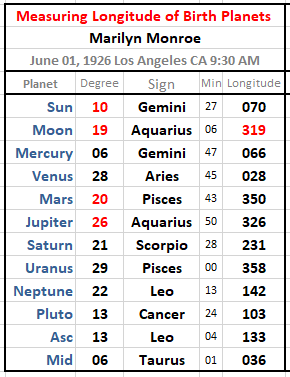 STAR NUMBER DETAIL: My mother's birthday of 7/10 is my Mars Number---and dang it, she was right about everything. My Jupiter is in Pisces in the 11th house. Makes me lucky within groups. Also makes me peaceful and receptive and musing, since my Jupiter trines with Venus. I also seem to have enough and always get want I need. I just love love love music, too--and I have a secret desire to be a singer or a musician. And, I'm actually the great great great granddaughter of a famous Maestro of the German Symphony. I often wonder if I might be his reincarnation. No really, I do. My Saturn is my what holds me together cause it trines my MOON, otherwise I would be completely off the cliff. It's the planet that told my Astrologer teacher to teach me privately. He told me he knew I would be a better Astrologer than him one day. He knew I would always be passionate about the Stars. He was right. My Uranus which is the planet that rules Astrology is in Virgo in my 5th house of children. Now although I've never had my own, I do however love to be around children, and it bugs me terribly when we have to suffer the loss of a missing child, especially when the Stars can help us learn more about who hurt them. So my astrological research into the matter of missing children is probably the most important part of my life path. It was peering into all those cases of children that I discovered the Star Numbers. STAR NUMBER DETAIL: A man born on 12/15 offered me a job that allowed me to make Colorado home for 10 years. My Neptune is conjunct my Venus, in the sixth so I often do a lot of charity work using the Stars because I want to make the world a better place. Neptune tightly conjuncts my Venus and it is this aspect that gives me both my love of photography and directing animation videos---but more over, its the aspect the blesses me with the divine gift to converse with those who have passed on. I use people star's to connect me with their loves ones. I'm always fascinated to see how spirit will come through with their messages. My Pluto is in Virgo also in the 5th House, and he his exactly Sextile to Virgo. This is the aspect that allows me to show compassion for most everyone. It's the power of love aspect. Love. Love. Love. Everything can be made better if we Love one another unconditionally, and allow others to be as humanly faulty as we are. "The Universe is not only queerer than we suppose, but queerer than we can suppose"